That ends Holyrood Live's coverage of the Scottish Parliament on 23 March 2017, the day MSPs united in solidarity with their sister parliament Westminster and the people of London. The acting conveners motion is agreed to unanimously. Childcare and Early Years Minister Mark McDonald says skill level training and regulation will be looked at going forward. Mr McDonald says the Scottish government has set up a working group to look at the recommendations of the Education Committee's inquiry into attainment. The minister says the positive example of Dingwall Academy should be looked at, as should Stoneywood Primary School who have established a BSL club. He says: "This has been a very consensual debate on a very important issue." Childcare and Early Years Minister Mark McDonald says the government recognise the shortage of interpreters and it will work towards improving this. Mr McDonald says the government are clear that there must be adequately qualified teachers in schools and it will work towards supporting local authorities to achieve that. The childcare and early years minister says it is great to see so many individuals in communities trying to promote and improve awareness of BSL. He says he hopes that it will not be long before we have the first deaf MSP in the chamber, adding that the first blind MSP was his colleague Dennis Robertson. Childcare and Early Years Minister Mark McDonald thanks the interpreters at the back of the chamber who have spent the afternoon signing the debate. Mr McDonald says three members of the National Advisory Group are in the gallery today and he thanks them for their work. Conservative MSP Liz Smith says legislation is not enough in itself. Ms Smith says the education committee is looking at ASN pupils. She says the student experience can be one of social exclusion and student unions are doing a lot of work in this area but there is clearly more to do. The Tory MSP says she would worry greatly if too many BSL pupils are losing out because they feel they cannot contribute to extra-curricular activities. She concludes saying for far too long the deaf community has had a raw deal. The BSL plan is a huge step in the right direction, she says. Ms Smith says it goes without saying that every child should have the opportunity to achieve in life. "If we are to get it right for every child then users of BSL must not be excluded," she says. The Tory MSP says the key issue is the attainment gap and there is a focus on resources and a funding "squeeze". Ms Smith says it is worrying that 11.8% of deaf pupils leave school without qualifications. Conservative MSP Liz Smith starts by thanking Mark Griffin and the Scottish government for the "extraordinary work they have done to get us to this stage". Ms Smith says there have been some very compelling anecdotes this afternoon bringing home exactly what this progress means on to the people on the ground. Ms Smith says this goal is hampered by an absence of a complete data set for deaf children. She says if there is a criticism of the government's plan it is in the educational provision for the dear. Mr Griffin says 90% of deaf children are born to hearing parents and the issue of parents not always having access to support in BSL must be rectified. The Labour MSP says urges his colleagues to support the motion at decision time and to respond to the consultation. Labour MSP Mark Griffin says BSL is the indigenous manual language in Scotland and is a distinct language. Mr Griffin says deaf people are part of a cultural and linguistic minority. He says deaf BSL users do not define themselves as disabled, as they just use a different language. 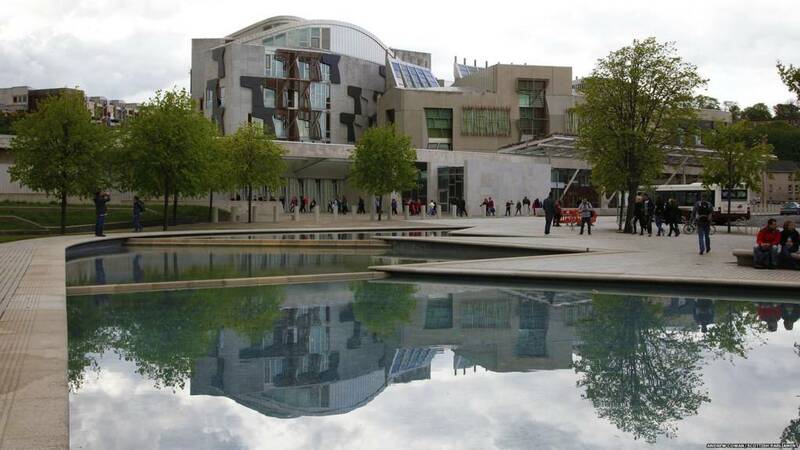 The Labour MSP says the government is committed to adapting services in its consultation. He says the reason Finland has so many more BSL interpreters, where many are family members which is not always appropriate, for example in a sensitive health consultation. In closing for his party, Labour MSP Mark Griffin says it has been an important debate and that he hopes it demonstrates the importance of BSL in society. Mr Griffin says this is a "fantastic example" of a minority group in society lobbying parliament on an important issue which results in action. The Labour MSP says BSL is the first language of many deaf people in Scotland. SNP MSP Stewart Stevenson signs: "I am ZS." This refers to when he was a software engineer and he had to choose a sign and "SS" was already taken. Mr Stevenson says lets support people to engage with BSL but also support those who are deaf. Tory MSP Miles Briggs has been learning BSL and he demonstrates the sign for President Donald Trump saying "you can probably guess what it is". Image caption: Tory MSP Miles Briggs has been learning BSL and he demonstrates the sign for President Donald Trump saying "you can probably guess what it is". Tory MSP Miles Briggs says today's debate is a good opportunity to feed into the consultation. Mr Briggs says this Bill rights attracts cross-party support. The Tory MSP says he has been learning BSL and it is a rich language. He says he has learned the new sign for President Donald Trump as he demonstrates what it is. He says he agrees that all information on health should be translated into BSL and easily accessible. Mr Briggs says Heathrow airport has signs in BSL and he'd be interested in how that can be developed in Scotland. "The key will be the delivery of the plan's proposals on the ground," he says. Scottish Greens MSP Alison Johnstone says she welcomes the consultation on the national plan. Ms Johnstone says 90% of deaf babies are born to hearing parents and these parents face real challenges in being able to communicate with their children. The Greens MSP says she welcomes the plans to give those families more support. "We need to do better for deaf and deafblind pupils in our schools," she says, pointing out that deaf pupils are often more advanced in BSL than their teachers. She asks if addressing this by 2023 is "rapid enough action". Labour MSP Rhoda Grant welcomes the consultation and pays tribute to Cathy Craigie and Mark Griffin for their efforts on behalf of BSL. She says it is "simply shocking" that attainment is so low for deaf children. This is a failure of communication, she says and goes on to welcome the suggestion BSL should be on the curriculum to increase awareness. Ms Grant says it is difficult to see how 80 BSL interpreters will adequately meet demand, as there around 3,850 deaf children in Scotland. SNP MSP Maree Todd welcomes those to the gallery in BSL. Ms Todd says Scotland was the first country in the UK to recognise BSL as a language. The SNP MSP says each country has it's own national sign language. "The ability to say I love you," should not be underestimated, she says, adding that people who are deaf should be able to communicate on aspects of everyday life. "This is about tackling social isolation and mental health issues," she says. Lib Dem MSP Tavish Scott says: "We all benefit from working towards a more inclusive society." Mr Scott says the government's draft plan notes that we should take advantage of a child's desire to learn, by teaching BSL in schools. The Lib Dem MSP says his own office does not have a interpreter and a video link would help with this but would require improvement in broadband connections on the islands. He says his party supports the motion and welcomes the consultation.